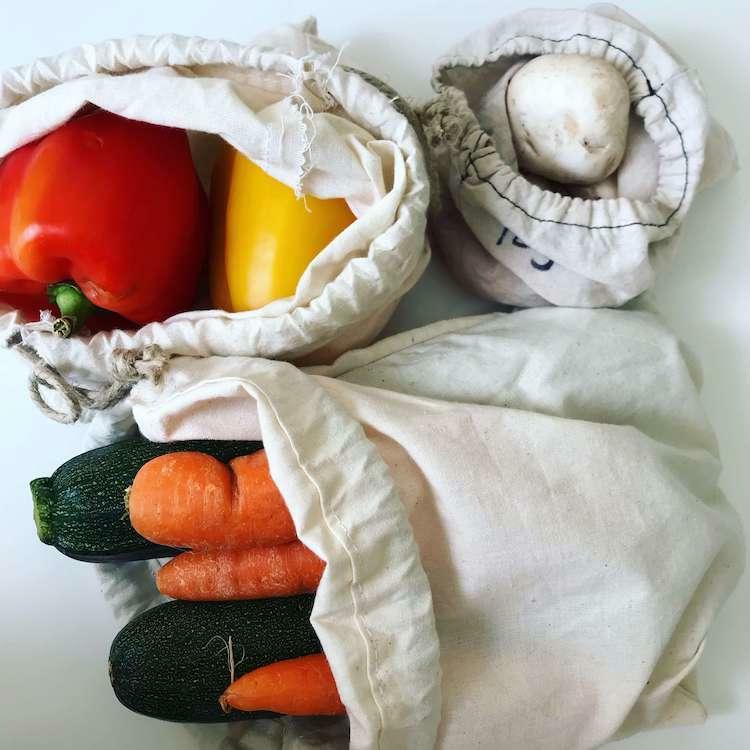 These reusable organic grocery bags are handmade with reducing the amount of waste you produce whilst shopping in mind. 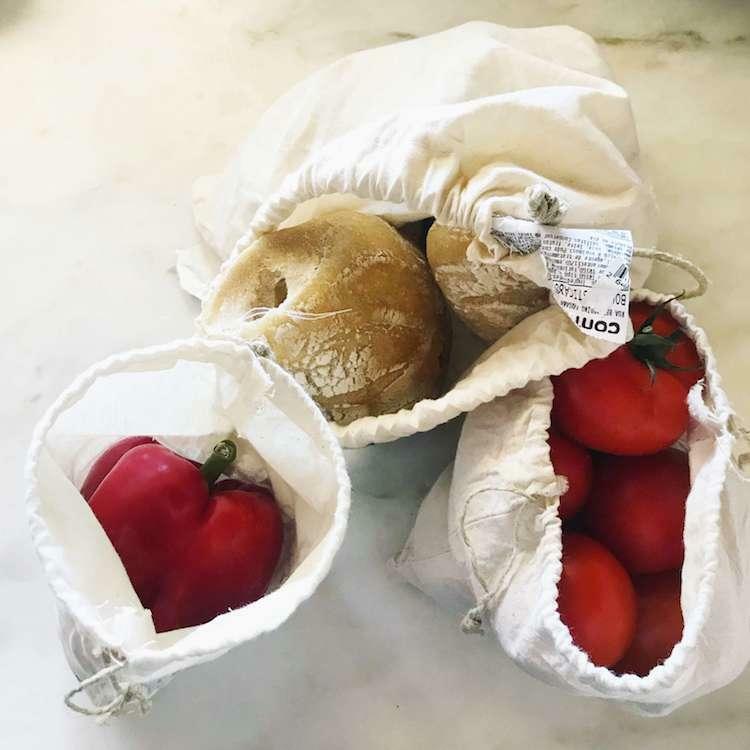 The drawstring design makes these produce bags easy to use whilst being super lightweight, ideal for keeping a few in your bag to shop zero waste on the go. 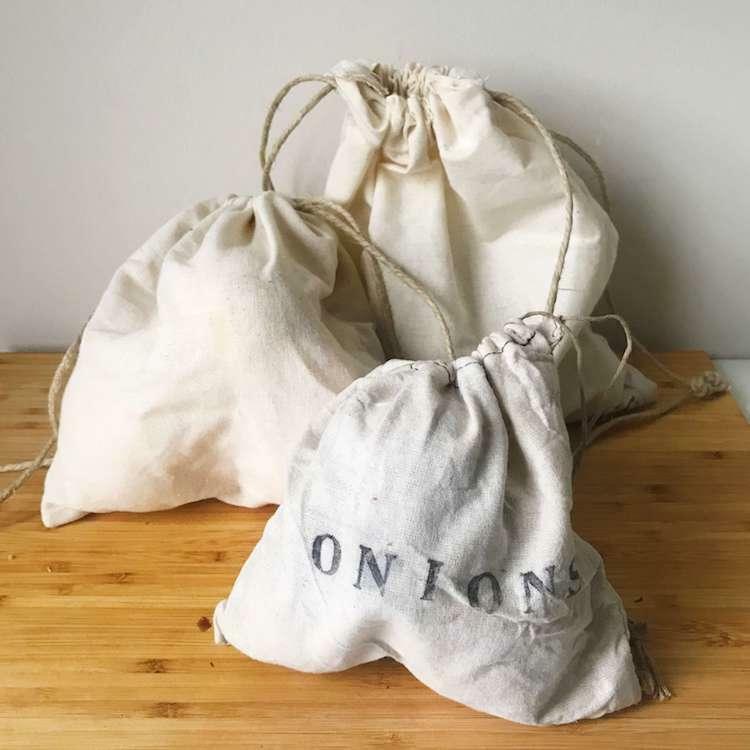 Not only are they're perfect for shopping the loose veg aisle but also for storing you food when you get home. Or keeping snacks in your handbag.. Extra Small (size varies) - This bag is made from scraps of leftover fabric from the bigger bags, this way we reduce our fabric wastage. As a result size of these bags varies slightly. Ideal for nuts, seeds and dry snacks such as crackers. Small (20cm x 20cm) - Ideal for smaller fruit and vegetables such as mushrooms, garlic, lemons etc. Medium (25cm x 29cm) - Ideal for larger veg such as onions, carrots, bananas etc or for filling up on grains in bulk stores. Large (35cm x 35cm) - Ideal for large root vegetables or picking up fresh bread from your local baker. The smaller sizes come as a set of two, you can also order a single large bag or there is also a set of 4 of each size. 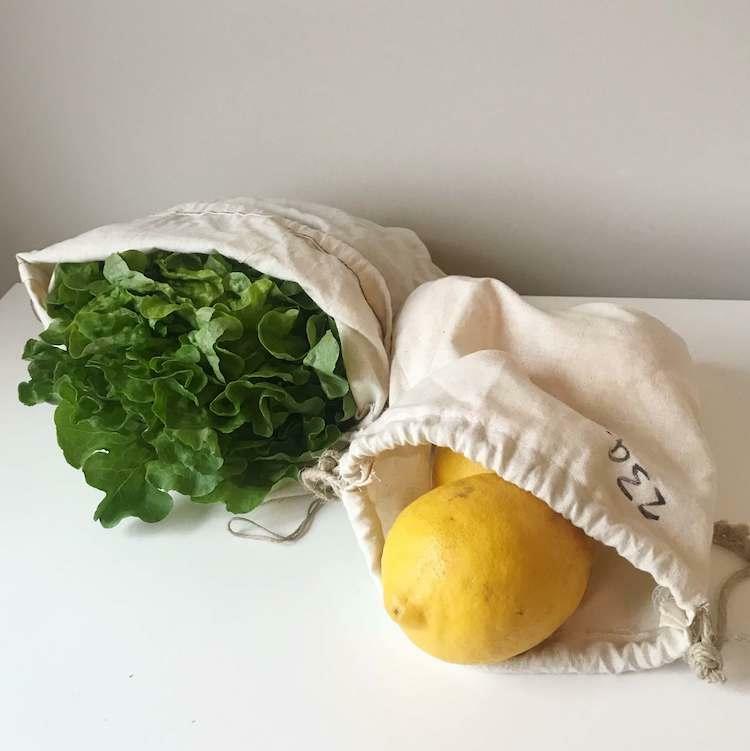 Each grocery bag is hand sewn in the UK using 100% GOTS certified organic cotton and cotton cord and stamped with non toxic ink. Personalisation - You can get these produce bags personalised to make it unique to you up to 10 characters. Please enter the personalisation in the additional information about your order box in the address part of checkout. Directions of care - Hand wash only. Product Packaging - Cardboard or paper packaging. 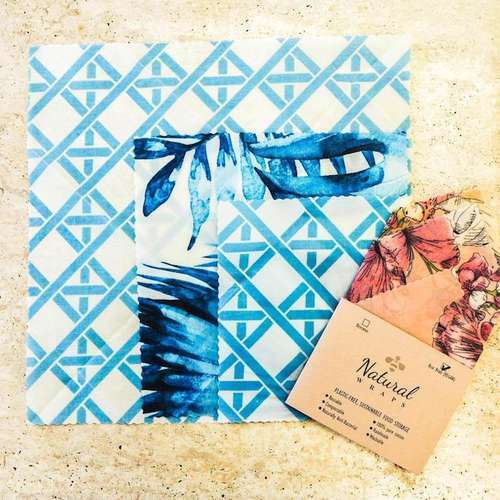 Agnes LDN is on a mission to help reduce the need for single use plastic with beautifully made sustainable goods. 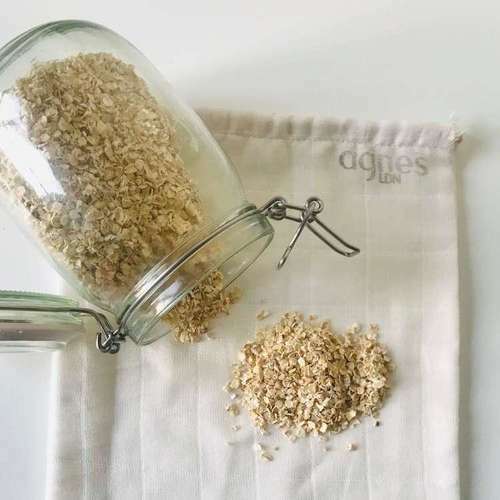 From organic cotton grocery bags to nut milk bags, all of Agnes’ products are handmade in small batches in the UK using natural and organic materials. Agnes is the creation of Sophie who has combined two of her passions, sewing and living as low waste as possible to help protect our planet. Postage Packaging - Smaller bags are packaged in recycled envelopes. The larger bags and order with more than one item are packaged in cardboard boxes that can be reused or recycled.